Knowing more about cirrostratus clouds will definitely add life to your cloud watching experience as it is one of the best looking clouds in the sky. Read on to get acquainted with this beautiful type of cloud. 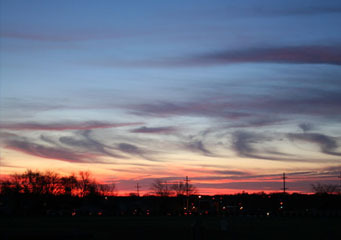 Cirrostratus clouds have thin, curly, sheet-like appearance capable of covering the entire sky. These clouds are relatively translucent which make it easy to see the sun or moon through them. In fact, cirrostratus plays a role in creating a dazzling halo of light surrounding the sun or moon. Also, cirrostratus moves with the course of wind flow, normally in westerly direction. Sometimes, these clouds signify warm frontal weather system and rainfall will follow within 24 hours. At What Height is Cirrostratus Clouds Found? Cirrostratus belongs to the high-level clouds found above 16,500 feet from the ground. Clouds at higher altitudes have very low temperatures; which is why cirrostratus is largely made up of ice crystals and light refraction causes these clouds to appear in beautiful awe-inspiring colors. These clouds have thin fibrous horizontal layers in different thickness that covers the sky with light gray to white colors. Sometimes, cirrostratus clouds appear in bands with thin layers between them. The ice crystals within them refract light from the sun or moon producing a halo effect. Meanwhile, the edges are uneven, though they are sometimes straight. When cirrostratus descends to a lower altitude, it becomes an altostratus cloud. When enough moisture is stored in them, the clouds appear whitish and indicate the presence of warm frontal system. Cirrostratus develops when large amounts of moist air rises and saturate forming ice crystals. This occurs due to large-scale convergence in the atmosphere. It may also form due to the restructuring of cirrus clouds. Although cirrostratus cloud formations may trigger slight turmoil in the atmosphere, they cannot likely upset aircraft operations nor bring discomfort to passengers. Besides, these clouds do not generate rainfall. Cirrostratus comes in different types such as fibratus, nebulosis, undulatus and duplicatus. Let us consider each one of them. This type of cirrostratus cloud is characterized by patchy and fibrous veils that stretch out across the sky. Sometimes, it is seen with cirrus clouds. The flush texture of cirrostratus fibratus is caused by blown ice crystals resulting from strong high-level atmospheric winds. Cirrostratus Nebulosis appears like a smooth, fog-like veil often creating a halo effect around the sun or moon. This particular cloud type often brings light rainfall within 24 hours. Distinct, wavy ripples define this type of cirrostratus clouds. Cirrostratus duplicatus is discernable by its multiple layers of cirrostratus clouds developing on top of each other. How common are Cirrostratus Clouds? These cloud formations are widely distributed across the globe. How would you know that what you are seeing is a cirrostratus cloud? Well, take a look at your shadow. If your shadow is visible on the ground, then the cloud you see in the sky is cirrostratus. Knowing about cirrostratus clouds not only enhances your cloud watching experience, but helps you realize that it’s a great day to stay outdoors as rain will unlikely occur.